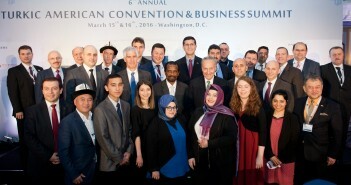 March 16, 2016, Washington, D.C. – The 6th Annual Turkic American Convention & Business Summit Pre-Gala Reception kicked off at 6:00pm in the Ballroom of the Willard InterContinental Hotel. The emcee of the evening, Bill Timoney, actor, director, and EbruTV host, greeted welcomed the participants to the gala dinner at 6.30pm. 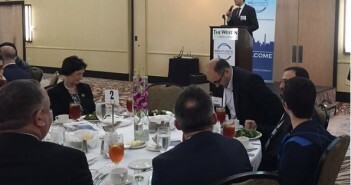 Congressman Brandon Boyle, showed his appreciation for the Turkish and Turkic Americans, considered them a “shining example “ in America for a new and growing community. He also thanked TAA for bringing together businessmen from across the globe to explore the american experience. Dr. Faruk Taban, President of Turkic American Alliance gave the opening remarks, and briefly shed light on the current state of Turkey, including the violation of human rights and lack of freedom of press. He was optimistic on the future relations between U.S. and Africa as well as building bridges and creating investment opportunities for key sectors and promoting American businesses abroad. In addition, he stressed the need to follow strong values and principles and inspire others to better serve society. He also affirmed the organization’s commitment to creating a long term partnership between us and africa on various fronts. Senator Charles Schumer, the keynote for the evening praised Turkey for its rich history and people. He also praised the Turkish Americans in the U.S. for their contributions in American society and promised to continue the maintaining strong relations with the turkish community in New York. He expressed disappointment on the deterioration of the freedom of press in the country, including the recent takeover of Zaman newspaper. He urged the turkish community to stand against violations on human rights and hold their leaders accountable for their actions on issues regarding press freedom and human rights. Senator Schumer was later presented a Turkish Calligraphy by Dr. Faruk Taban in appreciation. 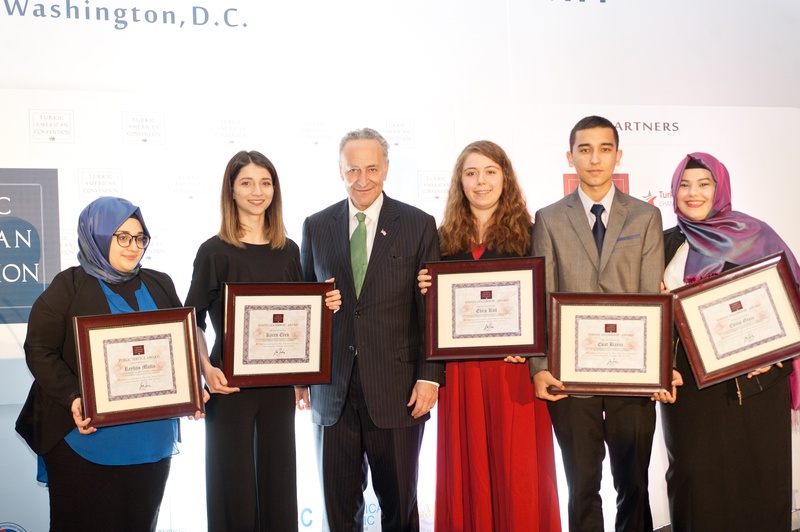 Thereafter, Senator Charles Schumer presented the Youth Leadership Awards, which recognized and honored the achievements of Turkic American high school and college students that have been active in contributing and serving the community. The Youth Leadership Award was given to Esma Geçir (Hackensack, NJ), Esat Bayar (Sugarland, TX), Ebru Kul (Brooklyn, NY) and Karen Eren (Brooklyn, NY). Halis Yaka (Boston, MA) was awarded the Emerging Leader Award and Reyhan Mutlu (Fairfax, VA) received the Public Service Award. Hon. Peter Henry Barlerin, Acting Deputy Assistant Secretary of the Bureau of African Affairs condemned the recent attacks in Ankara and sent his condolences to the victims of the tragedy. He encouraged American businesses to trade with African countries due to Africa’s growth in recent years and recommended the formation of partnerships in bringing electricity and power to Africa. He also advocated for increased collaborations with academia, business, and government to promote investment and involvement of women entrepreneurs in Africa. Kerim Balci, Editor in Chief Turkish Review, who is currently in a self-imposed exile from his home country, Turkey, voiced his concerns on the declining state of Turkey, also which has had a huge effect on families. He called for the country to follow the course of democracy and urged turkish companies to increase business relations and promote interdependence in trade — all of which he believes would result to freedoms. Emil Umetaliev, Former Economic Minister of the Kyrgyz Republic thanked TAA for inviting him to participate in this year’s convention and also discussed Kyrgyzstan’s efforts in being an open economy for trade and competitiveness as well as promoting freedom and human rights. 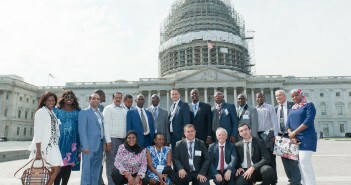 Ilyas Ustuney, President of Black Sea University in Tiblisi, shared his thoughts on the improvements in education in Georgia and finding ways of collaborating and partnering with the United States. Rev. Dr. R.Cooper, Sr., Founding Pastor of The Mission Baptist Church in Nassau, Bahamas, discussed his past experience in Turkey, when he visited the country 4 years ago and expressed his appreciation for TAA and its member federations expanding their reach to Bahamas. He also praised the Turkish people for their long history of preserving and maintaining high standards of education, intercultural relationship, peace, freedom and contributions to making the world a better place. Paul Abbate, Assistant Director in Charge of FBI Washington Field office concluded the Gala dinner by congratulating TAA for organizing a great convention. He shared the importance of safety and security in the U.S. and globally and valuing relationships with communities.